for the first official signing of my first Graphic Novel THE INDUSTRIALIST. This signing will be the conclusion of the highly anticipated 20th Anniversary tour of DEMANUFACTURE. Orbital Comics, 8 Great Newport St, London WC2H 7JA, United Kingdom. 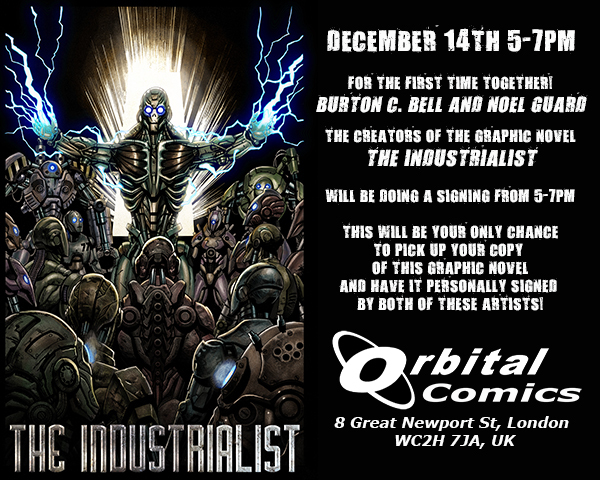 We will be selling and signing LIMITED copies of THE INDUSTRIALIST between 5pm-7pm. This will be the ONLY opportunity to have the graphic novel signed by Burton C. Bell and Noel Guard together! This event is a dream come true for all of us!